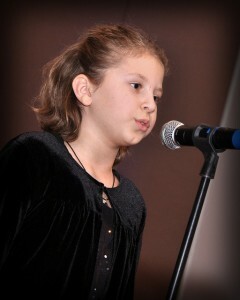 We have many students who take voice or singing lessons at our school. Our voice lessons are all private on-one-one instruction. Students sing all kinds of music from their favorite artists to classical arias. Our voice teachers all have a university degree in music specializing in voice and sing everything from pop and jazz to opera. Our teachers all have performance backgrounds as well. Just a sample of what a student will learn in singing lessons includes how to breathe properly, how to increase their range, proper pitch, how to project and stage presence. Our schools offer 2 optional performance opportunities each year with our Christmas recital, and Spring recital. We provide a professional accompanist who rehearses with the students and plays for them at the recitals. Many of our students also perform at local festivals.